Legare Farms’ Clean Out The Freezer Sale! The first Stono Café came into being 26 years ago on a shoestring budget and nothing more than the confidence of an excellent chef who, at 23 years old, was awarded the Gold Medal of Honor from Paris while working as the executive chef at Perdita’s, one of Charleston’s first fine dining restaurants. There were days, Barry remembered, that he would have to serve breakfast before he would have enough money to buy ingredients for lunch, and then the same thing for dinner. It was a struggle every day, but he was doing what he loved: and it showed. Before the restaurant even had a name it had regulars and they would line up, sometimes five deep, at the tiny counter behind which Barry would be putting on a show with the many sauté dishes in which he specialized. The first sign for the little restaurant was a gift from a set designer, Scott Carruth, who created the sign overnight after a graphic designer left a sketch of it scribbled on a napkin at the bar. The comraderie which the Stono Café inspired, as well as the amazing cuisine, carried Barry from his original location on Wappoo Drive to a larger location in the shopping center where the Terrace Theater is located on James Island. After 11 years in that location, Barry decided to move again to a spot just off of Maybank Highway where he could focus more on catering. “The catering was fine,” said Barry, remarking on how nice it was to have a quieter, less stressful environment for a while. The catering did so well, in fact, that he invited his cousin, Mimi Duffy, to move to Charleston and help him with the business. 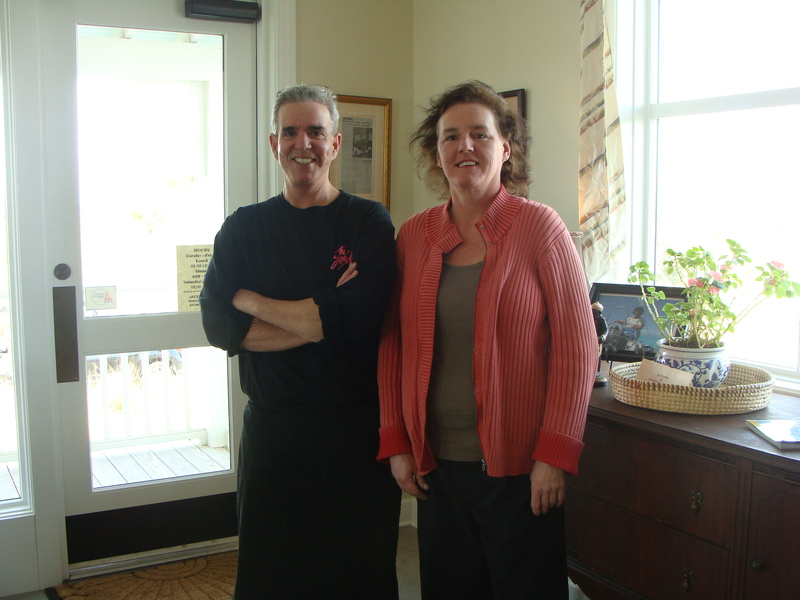 Mimi enjoyed the work so much that she soon branched off and opened her own restaurant, Mimi’s Café, which stood in an idyllic waterfront location off of Harborview Road for several years. But the recession soon pressed its grim hand against the catering company’s growth and Barry found himself wondering what he was going to do. Then the phone rang. And where they are is the best elements of both beloved restaurants combined. The colors of the restaurant are warm, light and airy, and there are plenty of windows looking onto the water; but that’s only if you want to sit inside. The wide porch boasts plenty of outdoor seating and leads back to a large outdoor wet bar which sits directly above the open harbor. 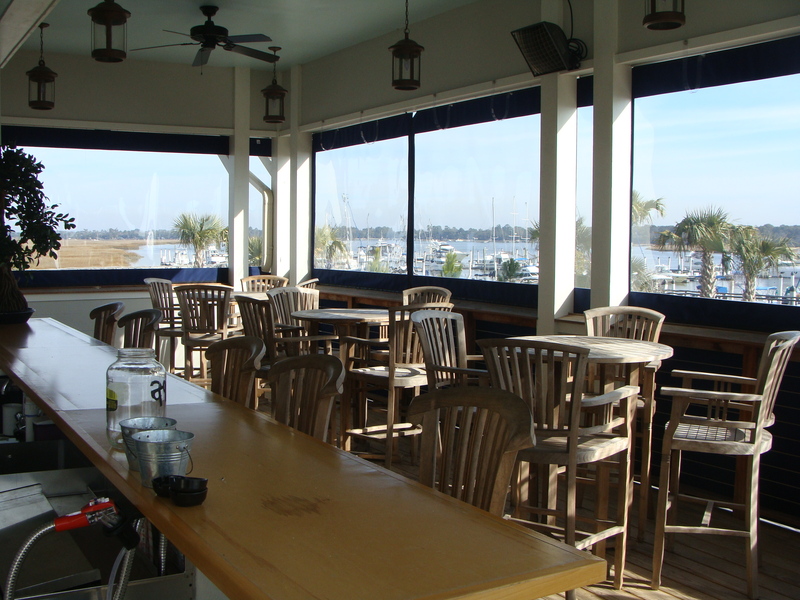 It’s the ideal place for oyster roasts or just catching the sunset, and if you want to do both, the Stono Café features all-you-can-eat oysters every Sunday from 2 to 6 p.m. with live music. The menu is both a Barry and Mimi signature. It’s short, simple and boasts the best of Lowcountry cuisine. Crab cakes made with fresh crab and little else; shrimp sautéed with bacon, tomato and scallion in a garlic cream sauce over stone-ground grits; Barry’s Famous Oysters which shows off the chef’s skills with a perfectly crisped pan-fried crust surrounding a fresh oyster served with citrus sauce on toast; and the epitome of island desserts – Mrs. Yvonne’s Famous Coconut Cake, which takes a minimum of three days to make as the cake has to sit and “marinate” before it’s ready to serve. The menu will certainly change a little here and there as Barry and Mimi learn their customers’ tastes, and there will always be at least one daily special. A few days ago, the featured item was Freshwater Catfish sautéed and served on a Crab Cake with a Beurre Blanc finish. 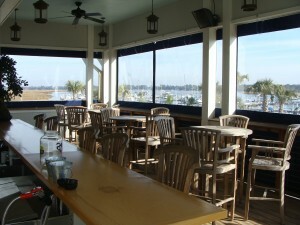 The Stono Café is located at St. Johns Yacht Harbor on Headquarters Island between James Island and Johns Island off the Stono bridge (2408 Maybank Highway). Lunch is served Tuesday – Friday from 11:30 a.m. to 2 p.m., and dinner is served Tuesday – Friday from 4 p.m. to 9 p.m. The restaurant is open all day Saturday and Sunday from 11:30 a.m. to 9 p.m. with all-you-can-eat oysters on Sundays from 2 to 6 p.m. during the season. Drop by on Super Bowl Sunday for all-you-can-eat oysters and the game on the big screen in the outdoor bar. The Stono Café also offers private catering and waterfront land and tents for outdoor weddings. A tastefully decorated dining room/lounge room is available for private dinners for up to 65 people. The private room is located directly on the water, which allows for arrival/departure by boat. For more information about catering, rental and wedding options, call event coordinator Myrna Flowers at 762-6660. 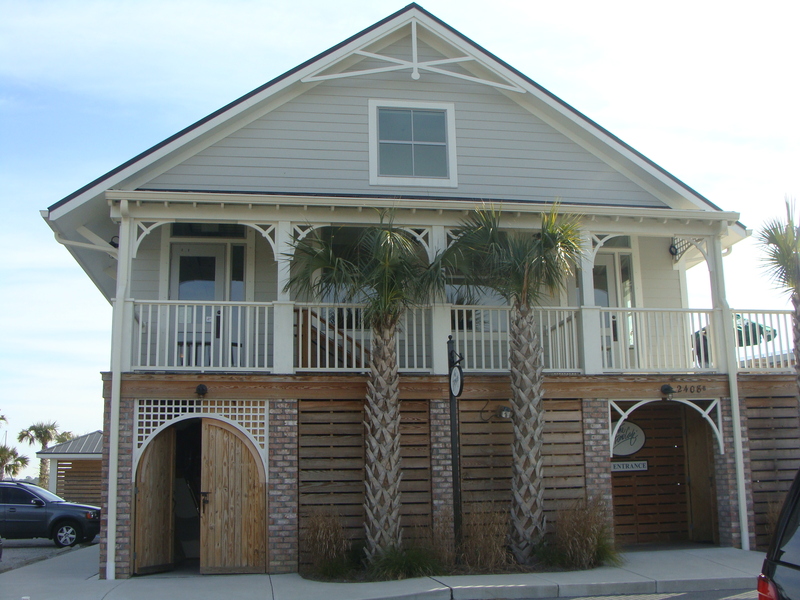 For more information about the Stono Café, call the St. Johns Yacht Harbor at 557-1027. So glad you have reopened as regular visitors to Charleston we missed you. Just hope you have your cajun chicken livers. My husband and I were at Stono Cafe on Mother’s Day and after hearing the server tell another table how good the crab cakes and the macaroni and cheese were, we decided to order them. I have lived in Charleston and eaten seafood all my life. When the she crab soup which my husband ordered came, it was lukewarm; the server reheated it. The macaroni and cheese was cold; it was reheated and was STILL cold. The crab cakes were unrecognizable!! There was VERY LITTLE crab meat, they were filled with what I think was some kind of bread, rather tasteless, and lukewarm. What a disappontment–we were looking forward to making the Stono Cafe a favorite place to eat! We paid for dinner, took home what we didn’t eat and immediately put it in the garbage. Why we took it home, I’ll never know. But what I do know is that I will never eat at Stono Cafe again nor will I in good conscience recommend it to anyone. Don’t eat here. Not good. We stopped in on Memorial day in hopes of a dinner at a new place in the area. There were signs up that said Memorial day special dinner menu etc.. We were not able to enter where the signs instructed us to go but there was another sign directing around the side and we entered by the pool and walked up the deck and asked 2 employees seated on the deck by the pool where to go. The gentlemen was very short in response and rude adding that we could get some mixed drinks and a chili dogs and that was it and this was probably not the place for us. I am not sure how the food is nor will I ever find out. I can however say that the help is rude and certainly not eager to bring new people in to eat. We went right down the road to the crabhouse where the help was fantastic and the food was great as well. We are from the area and will advise out-of-towners to head to the Crabhouse down the street and stay away from Stono Cafe.